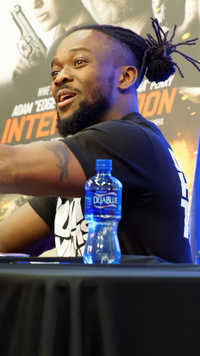 Kofi Nahaje Sarkodie-Mensah (born August 14, 1981) is a Ghanaian-American professional wrestler. He is signed to WWE on the Raw brand under the ring name Kofi Kingston, in which he is a member of The New Day along with teammates Big E and Xavier Woods. New Day are the current WWE Tag Team Champions in their second reign as a team. Since debuting in WWE, Kingston has won 12 championships. He is a four-time WWE Intercontinental Champion, a three-time WWE United States Champion, a record tying four WWE Tag Team Champion (once with Evan Bourne as Air Boom, once with R-Truth and twice with Big E and Xavier Woods) and a one time World Tag Team Champion with CM Punk. Kingston holds the record for cumulative days spent as a WWE Tag Team Champion. Kofi is also known for his innovative ways of suspending his elimination from battle royal and Royal Rumble matches. • WWE's New Day on Hulk Hogan: "We find it difficult to simply forget"
This webpage uses material from the Wikipedia article "Kofi_Kingston" and is licensed under the GNU Free Documentation License. Reality TV World is not responsible for any errors or omissions the Wikipedia article may contain.